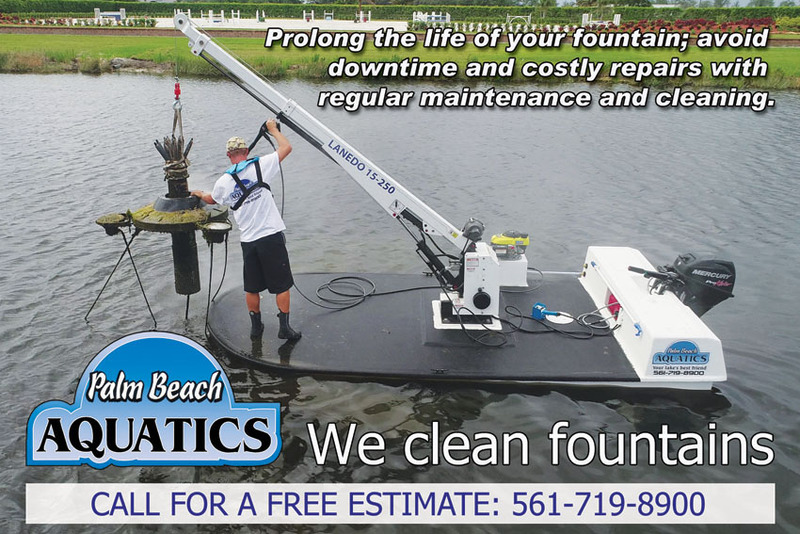 Full service lake fountain maintenance for Boca Raton specializing in lake management and wetland restoration. Palm Beach Aquatics Lakes and Wetlands is Florida's distributor of Aqua Control Fountains & Aerators. As Florida’s #1 distributor of Aqua Control fountains, Palm Beach Aquatics Lakes & Wetlands is able to provide you with the most efficient and durable fountains and display aerators on the market today. All of our models can be equipped with underwater lighting and other features such as; interchangeable nozzles, adjustable jet patterns, light sequencers, and wind sensors to limit evaporation. Palm Beach Aquatics lake fountain maintenance in Boca Raton also offers a full line of sub-surface circulators and lake bottom aeration systems designed to improve water flow, clarity, and dissolved oxygen levels from the lake bottom up without generating a visible pattern.